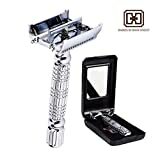 Safety razors, also called double-edged or DE razors, are for those men who love to shave. Blending old-school styles and new blade technology, double-edged razors are a popular choice for shaving enthusiasts. There a whole host of options and brands out there and choosing the right one can be tricky. 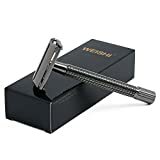 To that end we have put together this safety razor buying guide, shaving off valuable time in your search for finding the best safety razor for you. 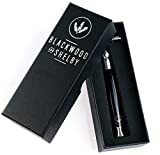 Closed Comb Safety Razors: Closed comb safety razors provide all the benefits of blade shaving with the added protection of a closed comb to help prevent annoying shaving nicks. Offering a smooth shave, closed comb safety razors are a popular choice for beginners and experienced shavers alike. 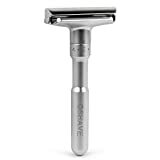 Open Comb Safety Razors: Designed for men with heavier beards and tougher growth, open comb safety razors have teeth that assist you by directing beard hair. Open comb safety razors allow for more lathering and are ideal if you are looking for less-razor build-up or clogging. 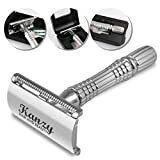 Adjustable Safety Razors: For more flexibility, adjustable safety razors are designed with experienced shavers in mind. Offering users the option to alter the distance between the bar and the blade, they create a closer shave in less time. 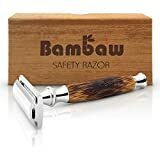 Build: Comfortable hefts, durable build and solid designs are all features that reviewers rate their safety razors on and razors that offer this are reviewed well. Comparing reviews of prospective safety razors will go a long way to product appreciation. 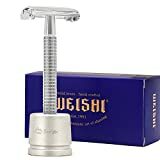 Shave: The key to good safety razor reviews is the closeness of the shave. Good quality razors that offer a close shave with minimal irritation are rated much higher than units that don’t offer the same shave. Choosing a reputable brand with good reviews will ensure you the same satisfaction. The first thing you need to consider when choosing a safety razor is the skill of the shaver. This will determine how aggressive the razor should be. Beginners may be more comfortable with standard razors while seasoned shavers may prefer the closer shaves adjustable or open comb safety razors may offer. Barberpole safety razors offer longer handles that some men with larger hands feel more comfortable using. Butterfly or twist-to-open (TTO) safety razors are designed with a twistable handle that makes changing blades easier than traditional safety razors. 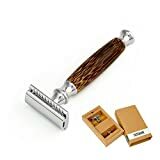 Safety razor kits that include shaving brush and creams will save you the initial purchase of buying those must-have accessories separately. Merkur: Offering a wide range of shaving products to suit a host of shave preferences, merkur is a well known quality brand. 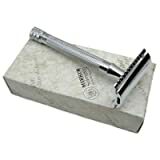 Parker Safety Razor: Parker is a family owned business that has been running since 1973 who pride themselves on manufacturing quality products and their excellent service. 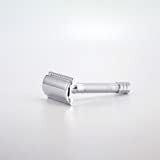 AmbroleyOnline: AmbroleyOnline specialise in quality safety razors. 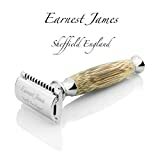 Edwin Jagger: Edwin Jagger is a family run business that was founded in 1988 and manufactoure shaving products exclusively.